The first blue whale to be killed by whalers in over 50 years has been killed in Iceland, according to reports. Animal rights activists have responded angrily to the news that a commercial whale fishing company killed the blue whale, which the company itself claim was a hybrid of a blue whale and a fin whale, which they are legally allowed to kill. Dr Phillip Clapham, of the NOAA Alaska Fisheries Science Centre, told the Metro: "While I can't entirely rule out the possibility that this is a hybrid, I don't see any characteristics that would suggest that. "From the photos, it has all the characteristics of a blue whale; given that - notably the colouration pattern - there is almost no possibility that an experienced observer would have misidentified it as anything else at sea." The Icelandic government has licensed the commercial fishing company, Hvalur, and its owner, Kristján Loftsson, to kill fin whales. Their founder, Paul Watson, said: "This man (Loftsson) must be stopped from ruthlessly violating international conservation law and bringing such disrepute to the nation of Iceland. There can be no legal justification for this crime." "I have viewed plenty of blue whales on the surface, dived with them beneath the surface in West Australia, off the coast of California, in the Southern Ocean and in the waters off Newfoundland. 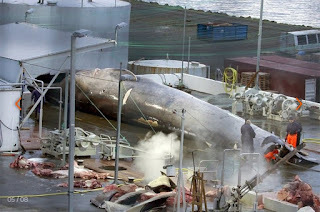 I know a blue whale when I see one and this whale slaughtered by Kristján Loftsson is a blue whale." Whaling is banned in almost every nation on earth, save for Iceland and Norway. Iceland recently allowed Hvalur to kill whales for the first time in two years and set a target of 191 whales to be caught in 2018. 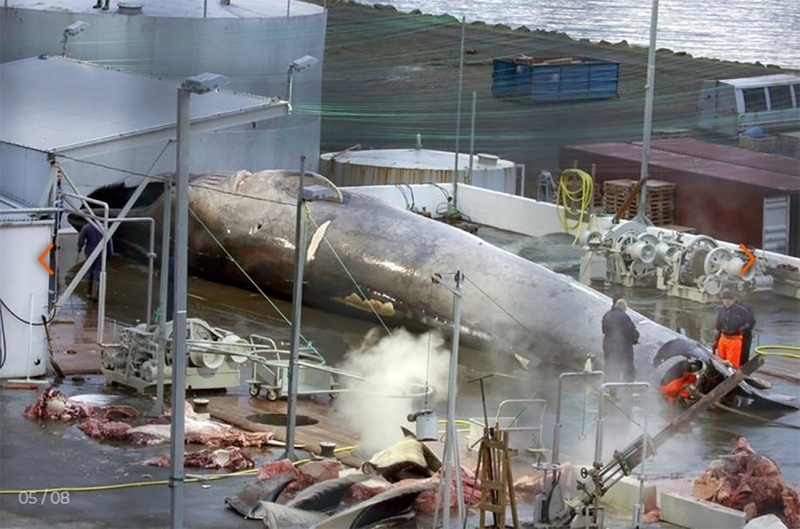 A change in Japanese regulations caused the Icelandic government to reconsider their moratorium on whaling, as Loftsson's company kills fin whales predominantly for export to the Japanese market. Robert Reed, the Chief Operating Officer of Sea Shepherd, said: "The crime committed against this iconic whale must be fully investigated by independent inspectors with DNA samples taken from all the whale meat and parts in storage at Loftsson's whaling station and warehouses since the whale has been butchered and removed from view potentially to hide the evidence as Loftsson has no authority (even within Iceland) to kill a blue whale. "In addition, environmental DNA samples should be taken from whaling station equipment, surfaces and containers to look for Blue whale DNA in case the butchered parts have been removed to hide this latest atrocity."